Revenge is the name of the game as Paris Saint Germain host Guingamp in a David against Goliath match up on Saturday night. Ligue One’s basement club caused the equivalent of a football tsunami a fortnight back when they ejected PSG from the Coupe de La Ligue at Stade de France. It was the Parisians first defeat in a domestic cup competition in four years. The money is on Thomas Tuchel’s Parisians extending their eighteen match unbeaten start to the season when they confront a Guingamp side building a good head of steam, following Wednesday’s 2-1 victory over on form Rennes. PSG’s central defensive partnership of Thilo Kehrer and Thiago Silva are sure to have their hands full containing Guingamp dangerman Marcos Thuram. 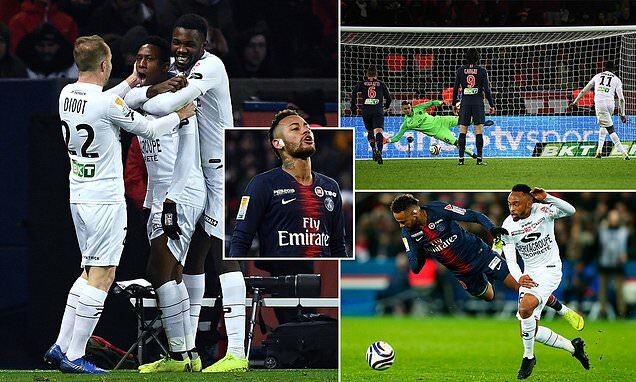 The son of France’s 1998 World Cup winner Lillian Thuram was unplayable in that cup victory, winning and converting the penalty that condemned PSG to defeat. The runaway leaders’ attack is to once again be spearheaded by the three musketeers:- 14 goal top scorer Kylian Mbappe Lottin, 11 goal world record signing Neymar and club all-time top scorer Edinson Cavani. Earlier, Christophe Galtier’s second placed Lille Metropole have a chance to put some pressure on the leaders when they host lowly Amiens. The hosts’ Ivorian sensation Nicholas Pepe is the man to look out for is Lille try to bridge a seemingly insurmountable thirteen point deficit on PSG. Elsewhere, former World Cup winner Cesc Fabregas is to be the centre of attention as Monaco try to shake off the shackles of relegation against Strasbourg. Fabregas arrived from Chelsea on a free transfer but he is yet to inspire Thierry Henry’s 2017 champions to victory. The principality club have drawn their last two encounters with Olympique Marseille and Nice one-all. Meanwhile, it’s all or nothing for Marseille boss Rudi Garcia when they travel to Caen. France’s only European club champions are struggling for form and could miss out on European qualification unless they can find a quick fix to errant striking that has seen them fall out of the top six positions.